Scripto has launched a new line of fishing-themed disposable lighters designed to attract die-hard anglers and amateurs alike. The line, featuring five different freshwater fish and Scripto's trademark child-resistant sparkwheel mechanism, is offered to retailers with a choice of a full-color fishing-themed counter display or Scripto's "Display-A-Tray." The lighters have a suggested retail price of $0.99. Scripto-Tokai Corporation, Rancho Cucamonga, Calif., Toll-free: (800) 241-8552, Web: www.scriptousa.com. First introduced in 1958, the Dunhill Rollagas Lighter is a shining example of Swiss precision and Dunhill's famed elegance. The company has introduced five new designs of the popular lighter. They all use butane gas, have adjustable flames, and can be fitted with optional cigar or pipe burner valves. Available in Palladium Paved, Gold Paved, Palladium Frame, Gold Frame, and Palladium Black Matte Broken "D," the new Rollagas lighters retail from $450 to $510. Music City Marketing, Inc., Nashville, Tenn., Tel: (800) 251-3016, Fax: (615) 832-0785, Web: www.musiccitymarketing.com. Dunhill has added Sidecar Travel Humidors to its popular Sidecar leather line of products. The humidors are available as either a single or double-layer style (with a removable tray). They are crafted in Spain from bitter-chocolate colored grained cowhide, with interiors lined in natural mahogany. Both styles have a magnetic invisible closure and a humidification device. The single-layer travel humidor retails for $360 and the double-layer style retails for $530. The Perelman's Pocket Cyclopedia of Cigars, a comprehensive one-volume authority on cigar brands marketed in the U.S. compiled annually by cigar reporter and columnist Rich Perelman, has just been published in its 10th anniversary edition. The completely revised 2004 edition includes in-depth information on over 1,002 brands of cigars from 23 different countries, including 851 handmade premium brands, 100 machine-made brands, and 51 small cigars. Brands which debuted or returned in 2003 are highlighted with special markings, and brands discontinued in that year are listed on a separate roster. The compact, 4 x 6-nch book is 554 pages and has a suggested retail price of $12.95. It has sold over 130,000 copies in its first nine editions. Perelman, Pioneer, and Company, Los Angeles, Calif., Tel: (213) 365-7965, Fax: (213) 365-7895. The new Griffin's Fiber Glass Humidors have a distinctive look, with the play of light between white and silver created by the glass fiber weave from which they are constructed. These meticulously hand-crafted humidors are spun from single, ultra-fine glass fibers that are woven together to produce a soft, silky weave. The exterior is then made mirror- smooth by an ultra-polished, multiple lacquer seal, and the interior is finished with natural, top quality sapele wood. Each humidor has a self-regulating humidification system to maintain cigars at the ideal 70-75% humidity level. The humidors are available in three sizes: small (50 cigars, $820) medium (75 cigars, $1,050), and large (120 cigars, $1,280). Each has convenient cigar dividers, and the largest comes with a removable tray. The medium and large sizes are equipped with lock and key. Davidoff of Geneva, Stamford, Conn., Toll-free: (800) 232-8436. J.C. Newman's Diamond Crown Leather Cigar Cases are entirely handmade by Spanish artisans. Each cigar case is fully lined and will comfortably hold up to a 54 ring-gauge cigar. Four styles are available, in black or tan. The "Robusto" accommodates cigars of sizes up to 5 1/2 x 54. The "Churchill" will hold cigars all the way up to 8 1/2 x 54. Both sizes are available in a two-fingered case retailing for $75, and a three-fingered case for $85. 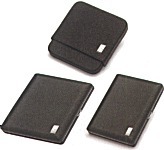 The leather cases come with a distinctive, gold-embossed felt pouch. J.C. Newman Cigar Co., Tampa, Fla., Tel: (813) 248-2124, fax: (813) 247-2135, Web: www.cigarfamily.com. Davidoff of Geneva has complemented its extensive Avo portfolio of premium cigars with these Avo porcelain ashtrays, celebrating two of the popular lines in Avo Uvezian's cigar brand. 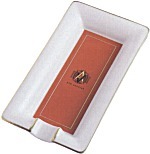 The Domaine Avo ashtray is 6 1/4 x 5 7/8 in dimension, and features the signature Avo logo along with silver trim. The Avo XO version is 3 1/4 x 6 7/8, and has gold trim surrounding the logo. The Domaine Avo has resting spaces for two cigars, while the Avo XO has one resting place for the solitary smoker. Suggested retail prices are $50 for the XO and $80 for the Domaine. The Quantum Vortex from Colibri of London boasts what the company refers to as the world's most advanced ignition system. Cigars will light up almost instantly with the wind-resistant double-flame from the Vortex's "twin V" SST ignition system. The advanced lighter also has a built-in cigar-cutter, a fuel-level viewing window, and the revolutionary Quantum firing mechanism, which conserves butane, extending the time between refills. All Colibri's Quantum series lighters have ignition systems that work free of batteries or flints. Four finishes are available: matte black & polished silver; light & dark gunmetal; satin pearl & polished silver; and red ice & polished silver. All are packaged in a stylish leather carrying pouch. Retail price is $100. Colibri of London, Cranston, R.I., Toll-free: (800) 556-7354, Fax: (401) 946-5276, Web: www.colibri.com.